I see a lot of tailgate benches and really like the concept and thought why not just build one. This project is loosely based on Chevy trucks from the 30s and 40s. I decided to take it a couple steps farther and make it look like the back of the box was cut off. After I did that I thought I need the front end so I managed to make a vague mock up. Everything is downsized so it wouldn’t be so big. Any way it was a fun project. Love this project and no Chevy trucks were hurt in the making of it way cool!!! Just had to turn the best picture to get a better look. Exactly, thanks for turning that photo. Very creative – looks super great. Best wall hanger I’ve seen in a longtime. Great work. -- I'm not addicted to buying tools or wood... I can stop any time I want! The Ford is my next project. By the request of many on social media. 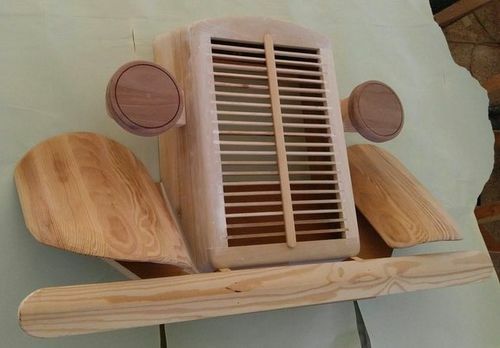 Don’t look now, there is a truck on your wall! This is absolutely cool idea! my 4 year old son knows at least half a dozen car brand names and he would be ecstatic if i make one like yours with a different emblem. Were the fenders coopered? I love this project and is perfect for all of those ‘Man Caves’ out there. Beautiful work! Fantastic job. I love this ! @Mark55 how did you do the fenders? did you make a curved router sled jig? Beautiful project. The colour is nice and ofcourse, car motive. 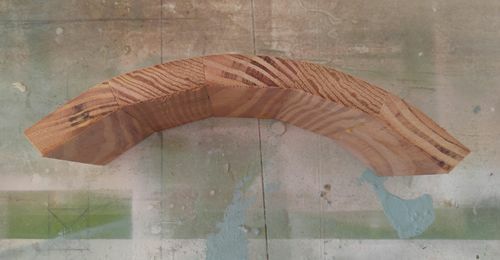 The fenders were made with strips of wood with a 5 degree angle and glued together to create the curve. Then I did a lot of grinding and sanding to give them more roundness and tapered the edges down so they didn’t look so thick.